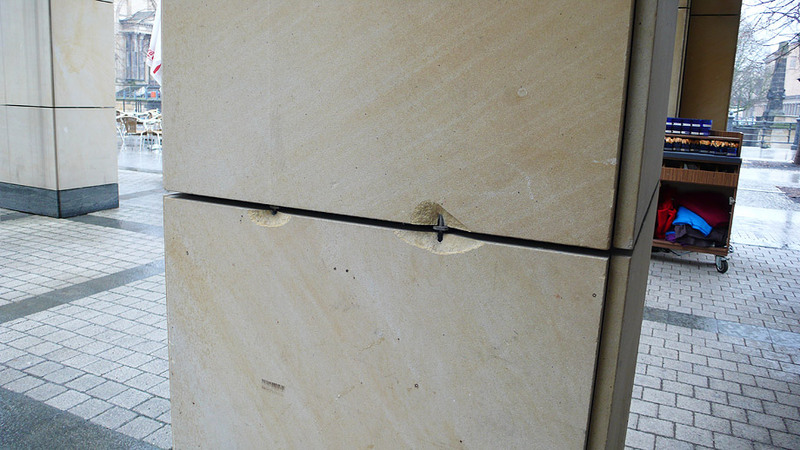 This has to be the architectural equivalent of a split fingernail. And if that’s the case then the whole of Berlin could do with a damned good manicure because this kind of thing can be seen city-wide. Gah! It makes my nostrils curl up at the edges just looking at it. The dinked column in question is part of a structure aping the peristyle of Roman architecture and belongs to a building with the sphincter-clenchingly horrid name of “SpreePalais”, meaning that it’s a palace on the river Spree. Geographically speaking, the name is not in dispute, but a palace? Getouttahere. Historically, the peristyle surrounded a lush courtyard with a fountain, but at SpreePalais, architects Nägele, Hofmann, Tiedemann & Partner have cleverly used it to enclose a draughty sandstone quarry where exiled office workers are required to smoke.